ARANZI POST CLUB membership started in March 2004. (Now in March 2018, the latest card is no. 144.) -The annual subscription fee is to be added to the order and we will inform you of the amended billing amount later by e-mail. 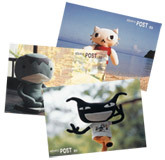 ARANZI POST CLUB will provide you with the member-exclusive postcards by airmail. The cards inform you about our new products and current events in Japan. The other side of every issue is specially designed for A.P.C. only. Sorry but all information is written in Japanese only. Annual subscription fee (membership fee) is 900 YEN. Total 12 postcards are delivered for a subscription period. You can easily to apply for the subscription here. If the postcard delivery address is different from the order, please also advise us together in the comment space. Likewise the subscribers can renew your subscriptions there as well. The annual subscription fee is to be added to the order and we will inform you of the amended billing amount later by e-mail.